Please vote by leaving a comment!! I cannot sing or dance, well I can but most people prefer not to see or hear it. I don’t blame them. So when I needed to make a project for the Grand Slam contest I decided to do what I love doing; sewing and quilting. Here is the story of the “GRAND SLAM QUILT”. 3 Years ago I was diagnosed with diabetes and in the last 4 years both my parents died of smoking related illness. Wow, what a wakeup call. Even though I have not smoked in 16 years I still have some damage from living around smokers all my life and from smoking myself; asthma. I decided that I needed to take charge of my health. I joined a “Healthy Living Support Group” with the YMCA. As a group we make short term goals to reach long term goals. Not only have I made several new friends and found that I am not alone in my struggle for a healthy life style but it has helped me stay on track with my goals. The other thing that came into my life was the Healthy Incentives challenges for King County insurance. 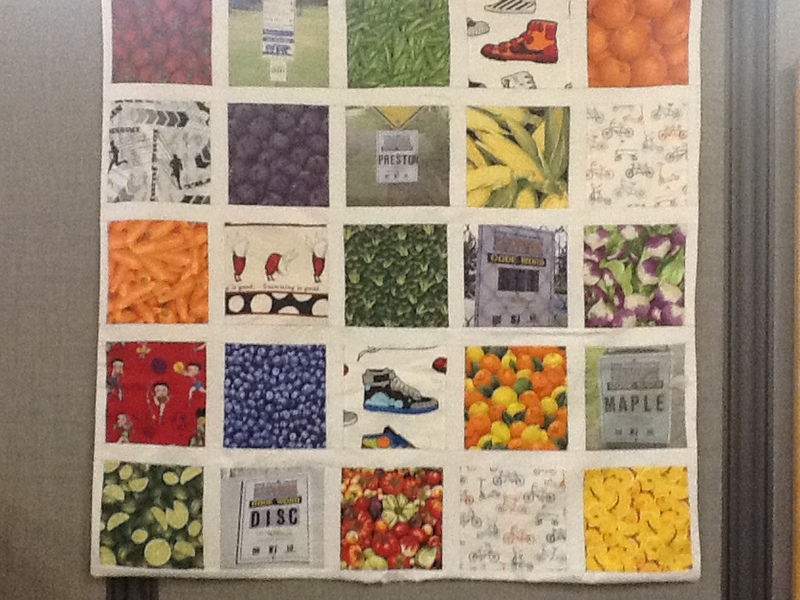 One year I chose the “colorful choices” , you can see some of the wonderful fruits and vegetables that I make part of my daily diet in the quilt. Another year I chose the exercise path. Some of the activities I chose are also in the quilt. I especially like Betty Boop and Olivia the pig. They work hard even though it is not what they are used to. This year I chose the Big Back Yard Challenge, this has been my favorite. I have been to many parks that I did not know about, two that are within 10 minutes of my home. The signs on the quilt are some of the codes words from the parks I visited. 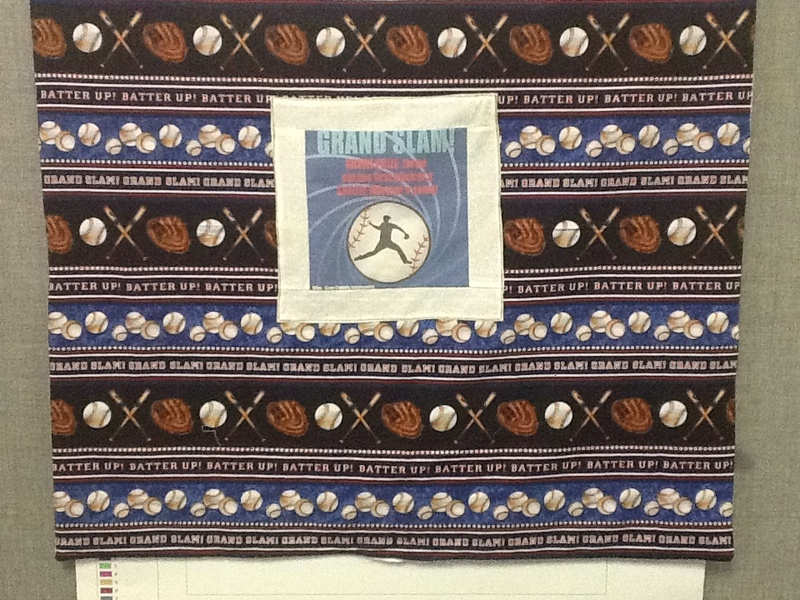 The back of the quilt represents the “Grand Slam Contest” . I like the part on the poster that says; WHO: King County Employees. I hope all enjoy the quilt as much as I enjoyed making it. Just so you know, I was able to reduce my diabetes medicine in half and have lost 30 pounds. I have found the way to get healthy and stay healthy is, of course, to eat better and exercise but neither of those are easy to do if it is a chore. So, I say MAKE IT FUN. Kathrynn, Thank you for sharing your story of what worked well to help you get healthier and more active. I like the quilt too. Way to go Kathrynn and great quilt! Great entry Kathrynn! Good luck! Excellent project Kathrynn; very inspirational quilt! Good luck! BEAUTIFUL!! — wish I had your talent! You can be proud of yourself for your healthy changes in your life. Good luck with your getting healthy project! What a wonderful entry from your heart and hands for your health. My vote is for you. It’s clear from your entry that you have many talents? Good luck Kathrynn. The quilt will inspire for generations. WOW ! What an awesome success story and as far as the quilt, you surely hit it out of the park with the bases loaded!!! My vote is for you! Your idea was not only unique, but inspiring! Best of luck! So proud of you Kathrynn! Kay, you are an inspiration and a great friend as well as the best “crafty” gal I know! Your commitment to a lifestyle of health is inspiring and your quilt is a fun & creative representation of that. Love it like crazy! Kay (and I know you are now Kathrynn, but I know you best as Kay!) Congrats to you for getting healthier and feeling stronger. It gets tougher as you get older and even tougher to maintain, but I agree that you have to have fun with your exercise or you won’t do it. I have added jumping rope 1200 times 3 times a week to my own routine of bike riding and hitting the gym on a daily basis. It really is amazing that just eliminating one bad habit and addiing one new one is enough to change your health for the better. Good luck on the contest and it really is a wonderful quilt! Take care..
You make beautiful quilts- you have got my vote. Very nice quilt. You have my vote. Neat quilt. Good luck with the contest. Great job, Kathrynn. You have such a talent and such enthusiasm. Regardless of the outcome of this, you will always be a winner! Fabulous quilt with an inspiring story! Kathrynn, nice job. I’m proud of your success, keep up the good work! Good Job ! Keep it up. Kathrynn, your story is very inspiring. Thanks for sharing and Keep up the Great Work!!! Congratulations on the weight loss, improved health and the beautiful quilt! Good luck. Congratulations on your Health Moves, and thanks for serving as an INSPIRATION!! Thank you for sharing your story. It offers inpiration for us all. And, very nice work on the quilt as well. Continue to work hard on your health goals with the same passion you have for quilting. Wishing you the best of luck. Don’t let the sugar problem get you down. I’ve survived it for 25 years.